I created Snow White for the Fairy Tale challenge for Art Doll Quarterly magazine and excited to share that she has been accepted and will be shown in the February 2016 edition. Be sure to pick up a copy at your local bookstore and show support to this wonderful magazine!! She has been sold so will not be listed in my shop. Feel free to check out my art page for many news dolls that I will be creating. I love sharing in progress pics so you are able to see them as they come to life. I had often wondered about the term “Mad as a march hare” and after researching I became inspired to make this piece. Basically March is the breeding season for hares and it is during this time in which they display a mad and unpredictable odd behavior, such as boxing with each other for dominance. It gave me the idea in which the female held the dominance, much like that of a black widow, or a preying mantis. In the process of attempting to mate with her, she fights back, leaving nothing but spilled blood and a pile of bones. I guess that sounds rather harsh, but that is honest story behind this piece. I added the ruff to give her a sense of royalty and power, and I decided golds and reds were appropriate colors for the theme. 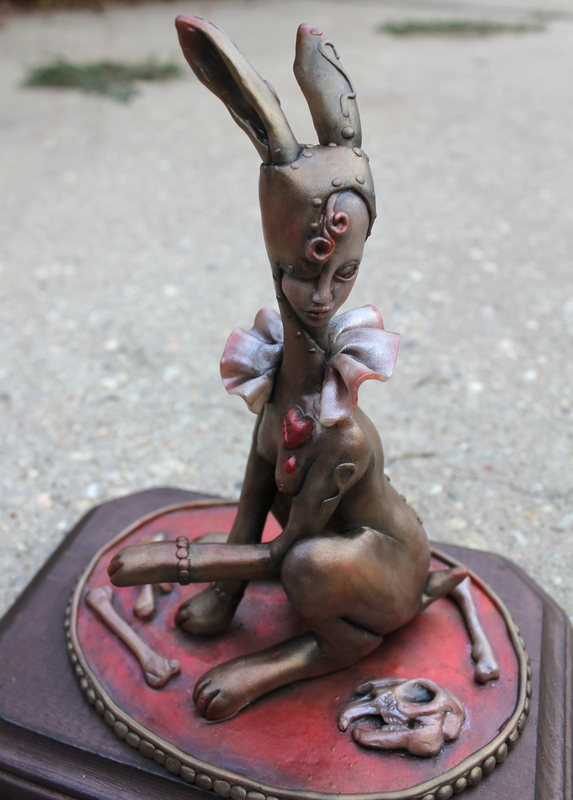 She is hand sculpted over a strong wire and aluminum foil armature, using cernit clay. She stands approximately 7″ high when taken off her wooden base. To protect her, she has been sealed in a gloss varnish.